It’s a long walk up between streets, a Wellington short cut, past cabbage trees and damp, tightly-planted agapanthus. […] Stopping to catch their beery breath, turning, they see the city below them. Closer, lights glow in scattered windows of the university buildings, patterning the sky. In ‘Beer goggles’, Warren and Lola take “a Wellington short cut” home to Lola’s Kelburn flat, after a night out on the Guinness. ‘Beer goggles’ is Tracy Farr’s contribution to Bonsai: Best small stories from Aotearoa New Zealand (Canterbury University Press, August 2018), edited by Michelle Elvy, Frankie McMillan and James Norcliffe. 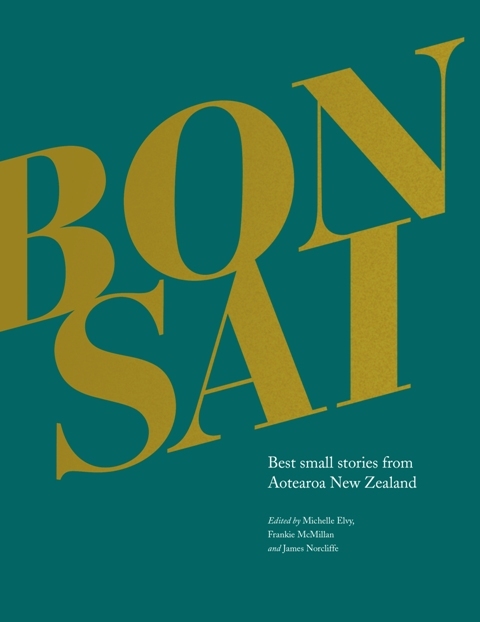 Bonsai brings together a collection of flash fiction and associated forms: 200 small stories of no more than 300 words from 165 writers in Aotearoa New Zealand, along with essays on the form. … is a hugely inclusive and elastic form with protean possibilities: stories may range from the vernacular to the poetic; from the open-eyed to the hyper-subtle; from the comic to the tragic to the deeply ambiguous. Often there is a luminescence to flash fiction. A musicality, too: like poetry, very short stories are best when language-driven. The stories [in Bonsai] come at you directly, and then turn askance, and then slap you in the face. We come across fiction that looks like poetry, and poetry that looks like fiction. […] These stories are slippery, and exciting. Contributors to Bonsai include Elizabeth Smither, Madeleine Slavick, Tracey Slaughter, Harry Ricketts, Chris Price, Vivienne Plumb, Emma Neale, Bill Manhire, Selina Tusitala Marsh, Fiona Farrell and Janis Freegard, among many others. Tracy writes here about her first published fiction, a “short short story” (flash fiction by another name) published 20 years ago, in 1998.